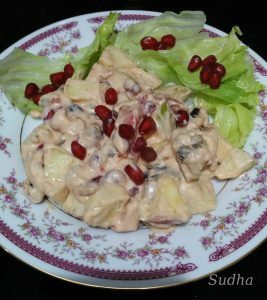 Waldorf salad is generally made of fresh apples, celery and walnuts dressed in mayonnaise and usually served on a bed of lettuce as an appetizer or light meal. I wanted a recipe without Mayonnaise; so searched and found one with Greek Yogurt. I did not add Celery but added watermelon and musk melon. 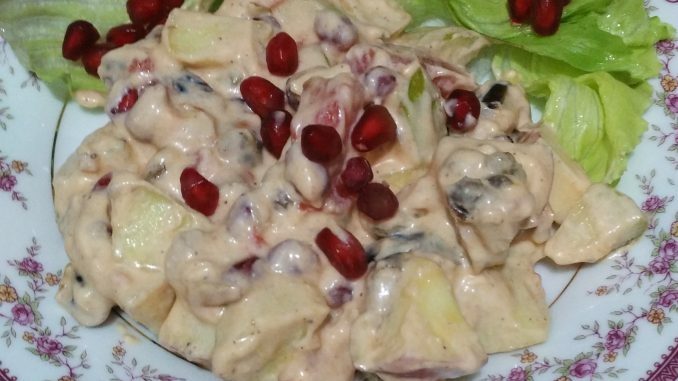 Since this recipe is different from the standard one, I call it Waldorf Salad with a twist. 1. For making Greek Yogurt, place Yogurt / Dahi / Curd on a thin cloth and tie a knot. Hang it somewhere and leave it for 3-4 hours. Keep a plate below it for collecting whey (Dahi ka paani). This Hung curd is also called Chakka in Marathi that we use for making Shrikhand. Take it out in a bowl. 2. Grate lemon peel on a fine grater to get Lemon zest. Mix Lemon zest, lemon juice, honey, salt, cinnamon powder, Nutmeg powder with Hung Curd. 3. Add freshly cut fruits, almond pieces and raisins and mix well. 4. Keep it in refrigerator. This Salad should be served chilled. 5. Spread lettuce on a serving plate and serve Waldorf Salad on it. 6. 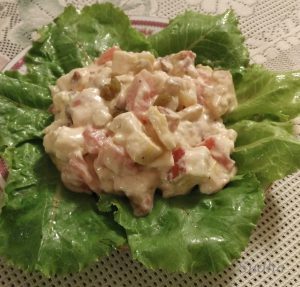 Enjoy this delicious Waldorf Salad.